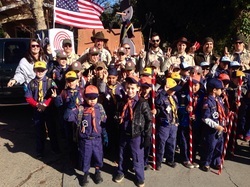 Pack 318 is a Cub Scout pack operating within Scouting BSA, and has been in existence for more than 50 years. We actively recruit from four elementary schools in Cambrian School District. If your child attends Bagby, Fammatre, Steindorf, or Farnham Elementary School he or she probably already has friends in Pack 318. We also welcome children who attend other schools in the area, or who attend school out of the area but live in our neighborhood. Our charter organization is Dance Boulevard located on Hillsdale Avenue in San Jose. Our leadership consists of volunteer parents of the scouts who are having fun in our pack. There is a role and a way for every parent to contribute, and every parent is expected to help make our pack work. All uniformed leaders receive training in youth protection and leadership skills. Our larger pack meeting is held at Fammatre Elementary School, usually on the third Thursday of the month. The smaller den meetings for each grade level are held at den family homes or at another location such as a school or park. Dens typically meet twice a month.